Have any questions or would like to get in touch with the Cajonbox team or Heidi Joubert? I saw a post on this website a while back about junior-sized cajons (bigger than the kids/toddler cajon, smaller than the adult cajon). Do you still sell these? Hi Heidi! Huge fan, quick question: do you anything to treat the playing surface of your cajon? During the winter, it gets extremely dry and cold where I live. Would you recommend any type of oils to apply to it? Thanks! hola quería felicitarlos por la gran música que hacen… es genial…. Ole Fernando, Muchos Gracias, que buenisimo es tu palabras! Is it possible to purchase an instrument and have it shipped to the USA? Please advise. Yes we post out cajons worldwide, USA being our most popular location to ship out to! There is an option to ship out to USA on our webshop, so do check it out! Let me know if you need any more help with your order! just want to say i love all of your stuff. thank you for beeing such an amazing musican! Heidi! I love you lessons! Thank you! I have a Meinl Subwoofer Bass Cajon that I want to mic. Is the best way to do it cutting a hole in the side and then putting a mic inside? I don’t want to destroy it, so I figured I’d find out first. I would like know which Cajon BlackBox you Played in Lessons video . The sound is Extremly good . If i want to buy Pl, write me the correct Box. Hey Heidi, I’m really interested in one of your cajons but I live in the US do you guys ship to the here yet? Nevermind, I went to checkout and saw that you do. Yes we ship worldwide, many to India! It’s safe, secure and reliable! We have a shipping option for international, simply check it out on our wbeshop! Let me know if you need any help with that! And I do love the Pro plus! When will the Cajon London School be starting a new course? I’d love to start learning! apologies for the late reply, we have just started new cjon classes, every week in London Camden town on Wed. Send me an email if you wanna join, we having so much fun! really learning a lot from your you tube channel. You probably been asked this a thousand times, do you have a video out? it would be easier than jumping through you tube, as my practice room is away from my computer, not yet had the time to run a connection to it. Very very soon I am releasing my COmplete cajon DVD method!!! So so excited! I suggest you sign up to my mailing list to be the first to know when it is released! hello Heidi, just a quick Question do you guys have a distributor here in USA? please let me know, have a wonderful day!!! Not yet. Hopefully we will get this sorted this year. I am a self-educated djembé player and I discovered by chance this wonderfull instrument. Il realy enjoy by playing percussion. I saw your lessons videos on youtube and I realy liked them. So I decided to become a cajon player. And as I make wooden furniture, I decided to build myself my cajon. The varnish is now dry and I’m a hurry to play tonight with my choir. I want to thank you for your great videos. Hello good day…i am from perth australia. I am about to order some of your cajones like the pro elite leon plus the cajon heavy duty bag but to check it out it worth $800 AUD in total plus shipping fee!? Cant afford it…I really do love your cajon and i think they are great! But are any consideration or discount if we are going to order? Thank hoping for response soon..cheers!!! It seems our shop is double charging you for shipping, basically it charges you for shipping an extra cajon for the bag too, so what we do at present is I refund you that extra shipping cost as we would post both items in one parcel. We are still updating our shop page and should have this little issue sorted soon, but for now, this is the way we work around it! Also we are going to be updating our shipping prices and make them a bit cheaper as we have now almost got a cheaper price on postage due to the number of cajons we are posting all over the world! If you want to, send me an email and we sort out a better price for you now so you can order one while they are still on sale. I want to know whats the diference between the Cruz Cajon Pro and Pro Plus Leon Model and Cruz Cajon Pro Pluz Toro Model. Is it possible to buy your cajon and have it delivered in canada? Heidi, I really like the way you look and play and was interested in buying the cruz cajon pro plus toro-model.I am a beginner cajon player and been researching different cajons.I really like the one you used on you tube teaching the rumba.does it come with a case?do you have a distributor in Los Angeles?How can I get it shiiped to my house in Covina California?Can you send me a price list in us dollars? Is your cajon dvd out? thank you for your time. I sent you an email as well, regarding the Pro Toro model. I have a few videos on the rumba on youtube, which one are you referring to? It can come in a thick strong padded case, you can get those cases on my webshop as well, but the case is not included with the cajon price, you need to buy it separately. No distribution in LA yet, we are currently working on getting distribution out in the US by end 2015. We do however ship our products out worlwide, most of our cajons go to the USA (of chichi CA is one of the popular destinations to which we post out our cajons) and they always arrive safely with our amazingly secure couriers. Apologies for the prices not being in displayed in dollars on our webshop, we have yet to update and upgrade our webshop to display the prices in international currencies. The best way to determine the price in dollars is to check it out online (as the exchange rate varies and can change), simply google ‘convert’ and you will find many websites that does a simple currency conversion for free. DVD is begin worked on and will be out pretty soon. It has taken me quite a while, due to many tours and shows I had to do last year, when I do finally release it, it will be really excellent! 🙂 Sign up to my cajonbox newsletter to be the first to know when it gets released. As the Pro Elite Toro model is currently out of stock I was looking at the Pro elite leon model, am i right in saying they are the same but the leon is natural colour with the toro has the black front plate? Could you please tell me what courier you use and do you get to track your package online? Awesome playing by the way! Yes the Pro Elite Leon has a natural front plate and natural Chassis (body), whereas the Pro Elite Toro has a black wenge (black transparent so you can see the grain of the wood) front plate and black wedge chassis (body). We use Parcelforce, and we use priority postage, and yes, when we post out a cajon it is fully tracked with a unique tracking number (so you can check out the progress online yourself). Plus is the one you used was it the 2014 model? I have a concert on the 20th December. Any chance would be here if I order it. Hola, Heidi, hace muy poco descubri el cajon flamenco, y todo su mundo maravilloso. Tambien toco un instrumento muy latinoamericano y muy argentino: el “bombo leguero”. Estoy aprendiendo mucho gracias a tus videos. Hi Heidi – you’re website has really come along in the last while. Excellent. Yo creo que deberías hablar más de la cultura detrás del instrumento que tocas, la comparación con los grandes maestros del Cajón Peruano. Thank you for my new cajon! I love it. It looks and sounds great. The two knob snare adjustment in the back of the cajon really nice feature. Thank you again, I am very very happy. Yes in September we start up! Je suis très contente de mon cajon très bon son il était très bien protégé et je l’ai reçu rapidement. Merci Heidi de nous faire partager ta passion et ton talent. Merci pour le CD superbe music. Hello! greetings from Colombia, I need to know if you send this products to my Country? I really want Cruz Cajon Pro – Leon Model. I wait for your answer, thanks and good luck. YEs we do! 🙂 Simply choose the international postage option. I found your website by searching for CAJON lessons. Great videos! to play and test a CRUZ CAJON? It would be great, if I can test one before buying. Shipping out your new baby on Tues or Wed this week. Our team are on it and you should have received a confirmation email from us, I will look into it and resend it! Looking forward to receiving the Cruz Cajon I have ordered. Can you please update me with a shipping date? A question for you: never tried to use a shaker when playing cajon? I’m looking for the best solution to use it! Haha I know it might not be easy to figure it out like that, so I will put up a vid very soon!!! Thanks! I am very waiting for it!! Cheers! So happy that watching your video on internet. I’m from China, I like cajon very much, but sorry my english is not good. My question is do you have lessons for people who wanna teach cajon to others. I think this is good for kids, I am 2 kids’s father, and I want teach more kids, how should I prepare for that? Hey! Why not immitate what I do on my lessons to the kids? Thats should help! Also you can make learning fun for kids by letting them sing the rhythmic phrases! Thanks for reply, that’s a good idea. I will keep on watching your videos. Hello Heidi, I saw the youtube video with yourself and Giovanni Spadoni playing on hangdrum….. now would you know make/model of this hangdrum he used? So I thought I better get intouch to see if you would know! No idea, I know they are really hard to get! Just another thing, i get a problem to mic my cajon for livre and recording sections . How do you mic your instrument whem you play?. Search my website for how to mike up the cajon, I have made a video specially for this! I’m brasilian and will Be in london for a 4 days in 04 to 08 of november. I would like to by a toro pro elite cajon and a bag to dispech in the avion . Frist off all ware i Ill get the cajon and you have the bag ? How mutch is the bag? At the moment we have no bags, but you would be able to buy one here in London in any drum shop easily. You would be welcome to buy one of my cruz cajons if I have any in stock when you come. 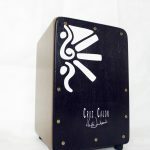 You can try and buy the cajon at my cajon classes which take place every Tues evening from 7pm- 9pm in central London. Hi, i ‘ll Be in London next week , have remain any pro elite model to take with me to Brazil ? I’m in London ware are your school or class exactly , are you’ll Be theare tomorow afternoon ? I have to Be at O2 17hs, Befor that i can Go to you to by the cajon pro elite model us i sade . Is that possible ? Hey Marcelo, the new Cruz cajons only arrive here on Thursday. If you would like to buy one on Thurday perhaps we can arrange it. Send me your mobile number or facebook contact if you have one. Classes are tonight from 7pm – 9pm in Old street, the venue is ISTD2 Dance studios, in the lecture room. Here is the address. ISTD2 Dance Studios & Meeting Rooms are situated at 346 Old Street in London, just 6 minutes walk from Old Street tube station and only 12 minutes from Liverpool Street Station. It costs £20 to drop in for both classes. I have no new cajons with me today, they only arrive on Thursday so I would not be able to sell one to you until Thursday. I am looking for a cajon player for my band both long term and for a recording in November. You must be into blues and be of a good standard and most importantly be a great person. Kind and soulful. I can have a look in our job in facebook New old days band . They’re almost back, we are taking pre orders and will have the new stock end October! Just discovered you today and fell in love. Thanks for all you do, you’re fantastic. Play snare drum in Richmond Concert Band. Playing Les Mis and it has a bongo part. Could I Play the bongo part with my cajon – snares off? Cant wait to order my cajon. just wondering how long before they become avaiable. Mám záujem o kúpu cajon toro. Kedy to bude možné? Ako je to s distribúciou do Slovenskej republiky? Can you please tell me the difference between your toro cruz and other prk like rabioso ,and can i hear sound samples(same mic) of the toro compare to the rabioso? Do you know when we be able to buy on or when they will be in stock again. Soon! If you are signed upto my newsletter you will be one of the first to know ok! Signed up for the newsletter – so looking forward to the new models! Can’t wait to get one to Western Australia for some jamming with my best mate when he visits from Sydney over Cristmas! from my point of view it is already a fact that you are the most motivated/ing cajon teacher… please keep on rocking and believing in god! And… could you please tell me how I can participate in learning from you somehow, even if I live in Munich/Germany. I read something about DVDs, a europe tour or skype lessons. Maybe there is a possibility to come to your school for some sort of a 1 week intensive workshop or something similar? In each case I would like to get more detailed information. I would like the ask more bout your cajon, is there a difference with Cruz and Toro besides the color? Thinking of buy a new cajon and donating my old one to my church. I have been watching your video on youtube and it’s very helpful. Practicing on it now. Thank you. Firstly i would like to know what kind of wood you are using on ur Cajon? my present Cajon is made from rubber wood and equiped with Snare string(Snare Cajon). Hope you can help me understand more the differences between String Cajon and Snare Cajon. I don’t know the difference about these 2 Cajon. Saw a gig one night at a local pub usingthe cajon as drum and was super interested and went up to him asking bout it. Without thinking much and bought one for myself. Thanks for your enquiry. At the moment I am unsure about my stock and also about woods as we are making major improvement changes to my cruz cajon brand as well as expanding the range, and this coupled with the fact that we have been experiencing such a huge amount of orders and demand, it might yet be a little while… however, I must say that it will be well worth the wait, seeing that the cruz cajon will be better than ever before made of much better wood when we stock up again! :-)) Sign up to our newsletter to stay updated! Thank you for your reply, i will wait for your good news! One thing I can say is that it will be the best value for money you can get! Sign up to my newsletter for updates on this! My son, aged 9, is learning standard drums and has been for 2.5 years. However, it’s rather a solitary occupation and a friend suggested I take him along to a percussion workshop to enjoy another aspect and fire his enthusiasm a bit. First of all, is he too young to attend the Cambridge workshops and if not, would he need to be at the first one and come to all of them? It’s quite a late finish for him on a school night. Are you planning any daytime workshops in Cambridge? Good to hear from you. firstly, no your son is not too young, we have a few other youngsters in our class (it’s oretty mixed), there’s another 11 yr old, a 10 yr old, a 13 yr old, a 14 yr old and a 16 yr old. Seeing that he already plays drums, I am certain that he would definitely be just as good if not better on the cajon than most of the adult students! 🙂 He’d be most welcome, we started up yesterday, but you can enrol him from next week. If you want to do that, please send me an email at londoncajonschool@gmail.com and we’ll get him on the course! Had a great time at the HANGOVER , despite the snow. I have posted photos on facebook if you’d like to become friends. Also, one of the venues at which we run workshops in the Summer, Hawkwood College, near Stroud, is hoping to run a weekend with Layne Redmond in August….. thought that you’d like to know. IF this comes off , Lina and I will definitely be there- unmissable! Thanks for the heads up, please do send me more details about this event I would love to check it out if possible!!! Bless you both and keep grooooooving and moooovin! I am awaiting the reply of our artesan who will have the answers to your request! Be in touch soon! I’m really interested in learning the cajon, I think that it sounds so therapeutic. Problem is I’m only free every other week because I work on a two week Rota of earlys and lates. I wondered if you did private lessons? Or a fortnightly lesson?? I live on the outskirts of Cambridge. Thanks for the msg! Why not drop in every 2 weeks to our Cambridge cajon class? I do not currently live in Cambridge so it makes it rather difficult to teach private classes, however, I could do it on Wed if you wanted to as I will be in Cambridge for the group class. Send me an e-mail and we can see if we can make it work somehow! Brazilian’m more alive in Portugal, when you pass by? I fell in love to hear you play, and it was good to feel how much you enjoy what you do, I hope to one day have the pleasure of knowing your work personally. I will reflect on you and I hope one day to get there. I wish you a happy new year, health, success and that all your wishes and dreams may come true. Thanks for sharing your helpful and motivating videos. You are really doing a great job and it is always a pleasure to see the fun and joy you seem to have. I would like to buy the arrabalero box. Do you ship to Argentina? Is that possible? Gracias por el mensaje. To ship to Argentina…Si es muy possible, of course, we post worlwide with tracked shipping, the cajon fully insurance to your house. I am from Germany (35j)and would like to learn play the Cajon. I see your Videos on Youtube, is there any DVD of you with leassons. I am unsure of what you mean, can you please rephrase so I can answer you accordingly? Thanks! you are doing great wonderful work in the field of music..
As per where you can find a cajon, I am unsure about India and I was unaware it is so difficult to find one there, and thats why cajonbox is great, we post out cajones worldwide, so we can send one directly to your house in India! This is a great solution, and one of the reasons why we have started up our online shop, to give people the opportunity to get an excellent handmade cajon anywhere in the world! I hope this helps! I look forward to visitng India someday soon…. So I would like to get a cajon, the CASTIGADOR black front, please! Los conocí una noche en Londres, bajo el London Eyes!! Y me encantaron, el sonido del cajón con tus manos fue impresionante. Nos llevamos “Calle Compas” y lo escuchamos y disfrutamos muchísimo acá en Buenos Aires. Me encantaría comprar el box rabioso o el arrabalero 🙂 Hacen o hicieron envíos a Argentina? Es posible? Are the Cajudoo Kaira available at this time? What would the total cost be? Thanks for writing to me! The new and improved Kaira cajudoos almost ready to be listed and sold on our site, give it another week and we’d have them available, just doing all the final testing of the new Cajudoo range. The new kaira is not as big as the older version, but it sounds better! and super bass! Pictures, vids and listings to follow soon! sign up to our cajonbox newsletter to stay updated on this! I have never owned a Cajon before however, I am looking at purchasing the Cajon Cruz with piano strings but wanted to know if you have had issues with strings breaking and how you go about replacing them if they do. Also, I noted in one of your posts that a full wood version was about to be available. Is it available and how do I purchase via the website? I personally never had a broken string, with one silly exception. I was tuning the cajon strings so tight that the string literally snapped. I was trying to get rid of a buzz but even though tuning the cajon can really imporve this, taping the problematic string/s down with tape is also a commonly used factor to stop a buzz…. so no, the breaking of strings is not really a thing that happens, unless you really do tighten the strings way too much than is needed. However, you can easily replace a broken string, but have to unscrew the frontboard in order to do so, it’s simple woodwork, however, like I said, broken strings is not really an issue to be worried about as long as you don’t overtune your cajon! If you are however concerned about this, then might I suggest you go for the non tunable Piano string system? There is no way the strings will break as firstly there is no tension tuning system, and also there is no need to adjust the strings. 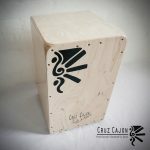 Purchasing a cruz cajon from cajonbox.com is easy! You simply find the product in the store, click on it, and then simply add it to your virtual shopping cart, and then you can choose to pay by paypal (even if you have not got a paypal account you can pay via paypal with your credit card) or you can choose to do a direct bank transfer into our cajonbox account. Really easy and safe! I sincerely hope this helps you, please let me know if you have other questions! The piano string option is currently my preferred based on your comments however do you have video on the website or anywhere that shows the difference in sound between the piano string and guitar string Cajons? You have really helped me make up my mind on my 1st Cajon and I will order directly and look forward to getting my skills up to scratch via your online lessons. One more thing. I am going with the Toro Cruz Piano String Cajon but notice it does not come with a bag and I could not see a bag for sale on the website. Could you please point me in the right direction to purchase a decent carry case. I am actually in the process of ordering some great cajon bags to sell on cajonbox.com, as I get many people wanting to obviously buy a bag with the cajon, however, that might still be a month or 2 before it materialises, so I would suggest you go for the Meinl Deluxe cajon bag for now, it is pricey but great quality! I’m writing from Palermo (Italy). 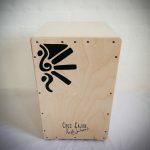 I’m interested in buying the “Prk cajon rabosio” https://cajonbox.com/cart/. I would like to know if it is available and the price with the cost of the spedition to Palermo (Sicily, Italy). How long do I need to wait for it, and how to pay? The price for the Prck Rabioso is £310 plus the postage to anywhere inside the EU which is £35, so all in all you are looking at £345, this inculdes postage & packaging. We post out the cajones fully insured, with a tracking number. Also at the moment there is a 1 week waiting period for any of our cajones because we are extremely busy with orders, especially with Chirstmas, but once we post it (approx 1 week after you ordered and paid for the cajon), it will take 1 – 2 weeks to reach you in Italy. So you are looking at about 2 weeks, max 3 weeks all in all. I love your vids and have proven to be very usefull. I have decided to invest in a new Cajon and would like to know what the difference between Cruz and Prk. As far as I can see there are less screws on the front of the Cruz. Is there a massive difference in sound? Also I am torn between guitar or piano strings. Is it easy to tune the guitar stings and in the event of needing to replace them is this straight forward. I’ve been playing the Cajon in an acoustic band for 10 months now. Im now looking to incorporate a splash/crash and was wondering what setup you gig with? I’ve only just been introduced to the magical percussion instrument The Cajon Drum. I love them, as I’m not so great at playing the drums, but have very good rhythm. I’ve been hitting table tops for 45 years (to the annoyance of my family and friends) cajons seem so suitable for what I want to do. Do you have a monthly payment system? I want a Cruz Cajon with piano strings, as it sounds genius. I love your lessons they seem really relaxed and will help me improve my playing. Please could you contact me WRT looking at distribution options for your range in South Africa, if you don’t have an official agent in the region as yet? Please email me direct if possible, and maybe remove this post straight after? What are your thoughts on adding a high hat with the Cajon? Very interesting that you ask, I have not yet formally added Hi hat to my cajon kit, but I have been working on this for the past 3 months (on my cowbell pedal) and am about to invest in one, it just takes a lot of co ordination to play with a hi hat, and up till now I have just been developing mainly my cajon technique… but yes, Hi hat is great and it’s the next development for me as a percussionist! 🙂 I will probably be adding some vids with the hi hat and some ex within the next 2 months. I’m using a hi hat with my set when I fx. play swing music. Either I play 2 and 4 with my foot or I use broomsticks (or sticks) to play the swingbeat on the hi hat. I also play the claves rhythm together with my congas. I think it’s great and it gives this metallic sound to the wooden/skin sound. Thanks for your great videolessons. I love this! Congratulations on your resourcefulness! Do you sel accessories as I am a singer song writer and would like to know if I could play this and a guitar using some kind of a pedal?